BY SOME OF THE WORLD'S MOST TALENTED PHOTOGRAPHERS. Many of the artists in the Museum's exhibition have helped create our rich heritage of fine photography. They include Brett Weston, Edward S. Curtis, Ansel Adams, Edward Weston, Don Worth, Al Weber, Philip Hyde, Morley Baer, Ted Orland, Timothy O'Sullivan, Edmund Teske, Donald Ross, Cole Weston, Todd Walker, Israel Russell, Stephen Johnson, and Burton Frasher, among others. The exhibition is sponsored by the National Audubon Society, Friends of the Earth Foundation, Sierra Club Foundation, the Mono lake Committee, the Polaroid Foundation, and Western Association of Art Museums. The exhibition curator is Stephen Johnson. The waters of ancient Mono Lake have splashed against its shores longer than homo sapiens has walked the earth. Geologists tell us the lake is certainly one million years old and may date back three million years. Visually, biologically, and geologically, this huge lake is an awesome sight. Three hundred miles north of Los Angeles on the eastern Sierra, Mono Lake is the oldest continuously existing lake in America. Mono has been chilled by an ice age, boiled by volcanoes spewing forth lava and ash, and held sacred by seven hundred generations of human beings. Its waters have overflowed southward into Owens Valley and most likely spilled into Death Valley's ancient Lake Manly. Mono has become home for the largest breeding population of California Gulls in the state and provides a precious oasis of food and rest for millions of migratory birds crossing the vast, waterless expanses of the Great Basin. The exhibition, "At Mono Lake," focuses its attention on one of California's most spectacular and least known natural treasures. The sheer beauty of this ancient lake is portrayed through the eyes of many of America's major photographers. It is a rare occurrence to have artists of the stature of Ansel Adams, Edward Weston, Brett Weston, Edward S. Curtis, Timothy O'Sullivan, Philip Hyde and Don Worth in this single, unique exhibition. That we were able to gather prints from such a wide variety of photographers, is in itself a great tribute to the intriguing beauty of Mono Lake's serene landscape. 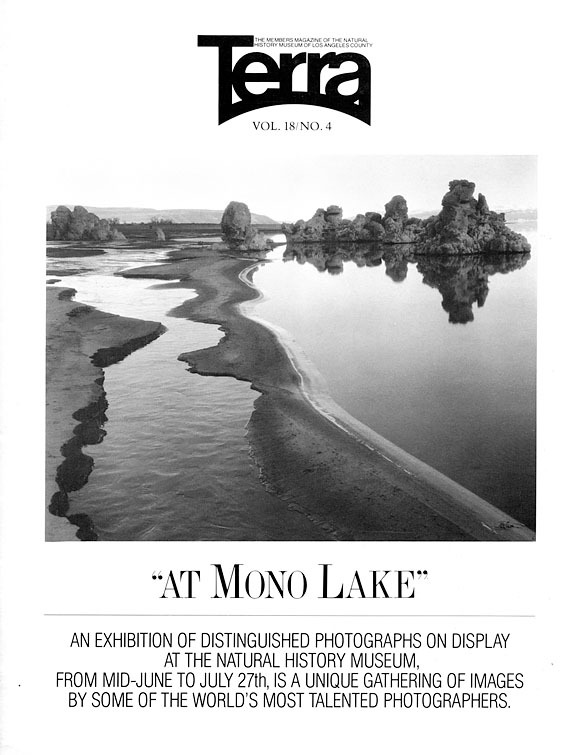 Despite the large body of fine photographs that we knew had been made at the lake, it was apparent from the outset that the exhibit would be limited in its ability to communicate the breadth of what Mono is. We knew that the air, the space, and the light of this magical place were unlikely to be captured on a piece of paper. Days were spent pouring through U.S. Geological Survey microfilm in search of an image that could symbolize the stark grandeur of Mono's setting. Circling in airless space 570 miles from earth, electronic cameras on board NASA's Landsat satellite recorded a surreal infrared composite rivaling the strangeness of walking Mono's shores. The San Joaquin Valley, Tuolumne, Yosemite, Mono, Kings Canyon, the Owens Valley, the White Mountains and the open desert of Nevada were all within sight. The Sierra slices through the image with grand Yosemite resting beside Mono's inky-blue expanse. Human constructions are splashed across the print but barely seen. The ancient shorelines of the lake stretch out across the Mono Basin onto the vast deserts of Nevada. Mono Lake lies on Highway 395 below the dramatic eastern escarpment of the Sierra Nevada, just east of Yosemite National Park. This inland sea (presently sixty-two square miles) is set amidst sharply drawn volcanic cones and the towering snow-clad peaks of the high Sierra. The Mono basin's self-contained drainage system explains its improbable presence among the vast space of its high desert surroundings. Its watershed extends over 700 square miles of mountains and desert. The lake has gradually become very alkaline as a result of minute quantities of salts carried by tributary streams and volcanic springs that until recently poured into the lake. Without an outlet, the salt concentrations in the water have continued to build. Mono is presently twice as saline and ten times as alkaline (pH 9.7) as the ocean. Providing a historical context became an early goal of the exhibition. Israel Russell's "Quaternary History of Mono Valley" and its many etchings drawn from photographs still stand as the major work on the area. The beautiful old lantern slides from Russell's original photographs became a major contribution to the exhibit. The now parched-dry Heart Lake on Paoha Island is portrayed brimming with water in an 1883 photograph by Russell. The "wonderful transparency of the dry atmosphere" emerges clearly from his images. He observed "the brilliant colors of the naked rocks...the desolate grandeur" of vast treeless vistas with Mono glowing at their focal point like "a wide sheet of burnished metal," and concluded that "no scene in nature has ever appeared...more attractive or more worthy a sacred corner in the memory than (this) bare, silent...desert." The care with which Russell explored this basin, constructed his descriptions and exposed his photographs is singularly impressive. Much folklore has been passed on about these unique waters of Mono Lake. The Paiute Indians are said to have believed that the strength of Mono's spirits would live as long as the sun burned and that its waters could heal a variety of diseases. Many explorers, among them Mark Twain, have extolled the water's cleansing properties. Tales of the pleasure of swimming in its soft, buoyant water are common. It is nearly impossible to sink in Mono Lake. An explosive past still haunts Mono's shores. The volcanic eruption of the Mono Craters must have been an awesome experience for those living in the region and may account for some of the legends this desert sea has engendered. Many of the major geological features of the basin are volcanic creations. The Mono Craters were violent, fiery explosions taking years to form, in contrast to Black Point's enormous eruption that took place underwater in a matter of days. A powerful volcanic uplifting caused Paoha Island's white, chalky surface to rise above the water. This spectacular event was accompanied by great explosive clouds of steam whose geothermal remnants still rise from the island's Warm Springs Cove. A tip from the Eastern California Museum in Independence led to one our most satisfying discoveries, Burton Frasher, whose photographs from the nineteen twenties and thirties proved invaluable. Frasher's studio in Pomona, California served as his headquarters, but apparently the Mono Lake I Mammoth Lakes area was his spiritual home. Frasher was an integral part of the growing community of Mono County before World War II. He photographed annual boat races, beauty contests, the "Mark Twain Day" celebrations and the construction of the Los Angeles aqueduct. Frasher traveled on the boat tours to Mono's islands and promoted tourism by bringing in a movie crew from southern California. The mural by Frasher, with hundreds of breeding gulls on Negit Island, together with his pristine views of the lake before diversions of water and dust storms, embodied our aspirations for "At Mono Lake." These photographs evocatively portrayed the magic and mystery of this place. Once called a "dead sea" by early explorers, Mono Lake is actually one of the most productive lakes in the world. A delicate, unique species of brine shrimp (Artemia monica) make Mono their home. Swimming in the lake by the trillions, the shrimp feed on enormous clouds of drifting phytoplankton. Over twenty tons of these tiny shrimp are harvested commercially every year without making a dent in their vast population. With no competition from fish, millions of birds thrive on these huge numbers of brine shrimp and balance out an ecosystem that converts more solar energy into "life-energy" than almost any place on earth. Throughout its long history the black obsidian cone that is Negit Island has provided a home and safe breeding ground for ninety-five percent of our state's California Gulls (Larus californicus). At least twelve different species of birds nest at Mono and thirty-two varieties of waterfowl have been observed taking advantage of the lake's phenomenally productive biological community. The incredible productivity of Mono Lake has made it a necessary and welcome oasis on a vast wasteland. Surrounding the lake are strange white towers known as tufa that are actually carbonate deposits left by fresh water springs that once bubbled under Mono's waters. These now-exposed towers stand like ceremonial monuments, silent reminders of higher water levels of the recent past. In 1940 the Los Angeles Department of Water and Power completed an extension of its Owens Valley aqueduct and began exporting water from Mono Lake's main sources of fresh water. Since that time the lake has been dropping due to unreplenished evaporation at a rate of one foot per year, and since 1970 at two feet per year. Mono Lake has now dropped over forty-three vertical feet and left 15,000 acres of former lakebed exposed. As a result, a landbridge has formed to Negit Island, providing access to coyotes and other predators who prey on nesting gulls. This intrusion has destroyed Negit's irreplaceable state protected rookery. Where nearly 50,000 gulls once nested, in 1979 only 3,000 manage to rear their young on small islets northeast of Negit, which are also rapidly being overtaken by the growing landbridge. The exposed lakebed has left vast expanses of alkaline dust free to be blown by the high winds in the basin and has created huge chemical dust storms. As the water recedes, its alkalinity increases, threatening the survival of the brine shrimp. As the water lowers, the weight of the lake shrinks, exerting less pressure on the ground and no longer forcing water up into the many springs that once encircled the lake. Moreover, with diverted streams and dry springs causing such drastic reductions in the amount of fresh water available, myriads of migratory birds are likely to find this one-time oasis of food and water a less welcome refuge. This photographic exhibition provides these artists with a special opportunity for their work to have an effect on issues that deeply concern them, and also underscores the power of the photographic image. "At Mono Lake" helps make clear the unique and important role the artist can play in the understanding and preservation of our wilderness areas. When asked to participate in the show, Philip Hyde jokingly commented, "What self-respecting photographer has not photographed at Mono Lake." Edmund Teske's "Legend of Mono Lake" was inspired by a student whose grandfather drowned in Mono's waters. Teske refers to the lake as "mystically sacred," while Brett Weston declares himself a "Mono-maniac." Similar feelings to Russell's eloquent impressions of one hundred years ago and our concern for the lake's future led myself, Al Weber, Don Worth and many generous photographers to assemble "At Mono Lake." While important ecological issues are involved, the exhibition is not a discussion of water rights or any other of the legal questions involved in the continuing destruction of Mono Lake. This collection is not meant to be a documentary of Mono. It is a visual statement about a splendid, ancient place by artists who have a deep reverence for it. Among the materials and processes employed in this eighty-five print collection are gelatin silver prints, albumin, gum bichromate, gravure plates bleached/toned prints, color work, and transmitted television images. The variety of approaches contained in this ; show are united by one theme--the unswerving directness of this solemn, seemingly misplaced sea. The photographs range in size from 4 x 5 inch contact prints to a 27 x 60 inch mural; prints date from 1868 to 1980. Mono Lake's unique environment is viewed through aerial, underwater, satellite and microscopic images. The variety of landforms, distinct seasonal changes and abundant wildlife are particularly suited to these diverse perspectives. These photographs currently are on a one-year California tour and in 1981 will begin touring with the Western Association of Art Museums which will carry them throughout the United States. A catalog from the show will be published shortly by Friends of the Earth Books. Posters, postcards and slide sets are available in the Museum bookshop. The engagement at the Natural History Museum runs through July 27th, and is located in the second floor Director's gallery. Stephen Johnson, the exhibition's curator, has taught photography at community colleges in California and workshops throughout the west. His own photographs have shown in numerous exhibitions. Currently he teaches photography at Skyline College, San Bruno California. Photographs and Text Copyright ©2010, Stephen Johnson. All Rights Reserved Worldwide.